"I've designed this EXCLUSIVE limited edition tee and sweatshirt just for my fans! 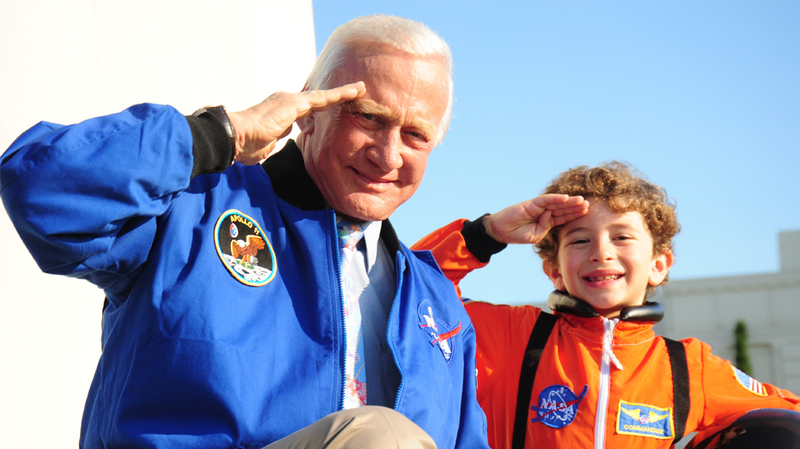 Buzz Aldrin’s ShareSpace Foundation addresses science literacy by igniting children’s passion for science, technology, engineering, arts and math (STEAM) through delivering hands-on activities, inspirational messages, educational visits and Innovation Kits. ShareSpace provides children the opportunity to experience pivotal moments of discovery. ShareSpace inspires children to have a lifelong, life-changing love of STEM, coupled with artistry (STEAM), at an early impressionable age. One way we do this is by putting unique Buzz Aldrin Innovation Kits in the hands of young people. By exploring and building these kits, children have the opportunity to innovate, discover, experiment and create; taking their curiosity and transforming it into a keen interest and potentially lifelong engagement in innovation. The National Research Council states that early exposure to STEM supports children’s overall academic growth, develops early critical thinking and reasoning skills, and enhances later interest in STEM study and careers. Even more so, by integrating Art and Design into STEM education, children will be even more equipped and inspired to become innovators of the 21st century.